For Valentine's Day, why say "I love you" with a simple card, when a set of love cards in a gorgeous box can be hers? 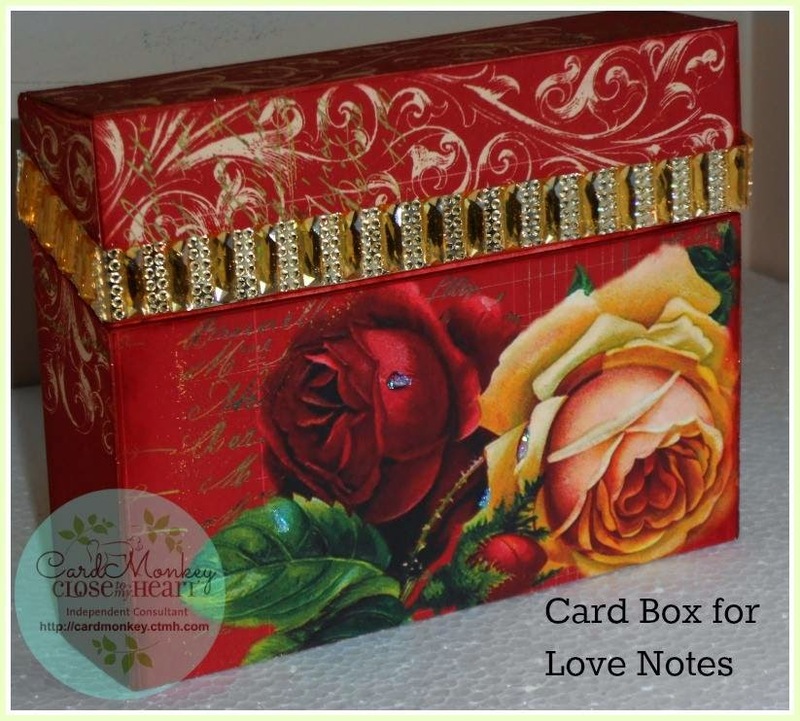 I made this Card Box for Love Notes, covering one of Close To My Heart's Journaling Cards Box with CTMH's Yuletide Carol paper. Yuletide? 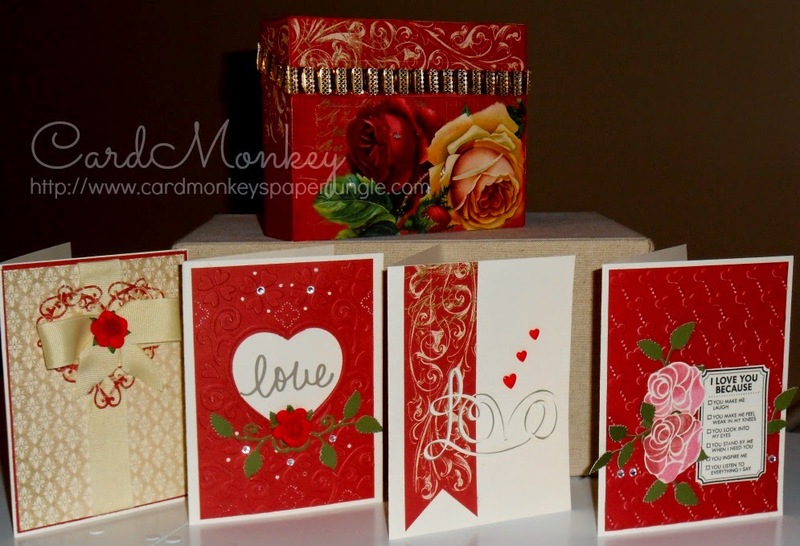 Yes, right -- I think the roses on the pretty ruby paper is much better suited to Valentine's Day. Lovely, aren't they? Topping off the hinged opening is a strip of fancy Gold Rectangle Dazzling Diamond self-adhesive sticker sheets from The Buckle Boutique. I simply trimmed the row using standard scissors, peeled off the sticker back, and adhered it to the box. The scissors cut through the resin very easily, for when I needed to trim them on a slant for the box sides. Now, while I intend to write a love note for my sweetie (hubby John) to put inside of the box for Valentine's Day (shhhh, don't tell), I also made a set of four cards that could be used within the box if that's more your style. For this card, I used a CTMH Colonial White card base and topped it with a layer of CTMH Ruby cardstock, and then a layer of tan damask print paper from the Yuletide Carol paper pack. I tied a pretty beige grosgrain ribbon around the height of the card (securing under the Yuletide Carol layer). 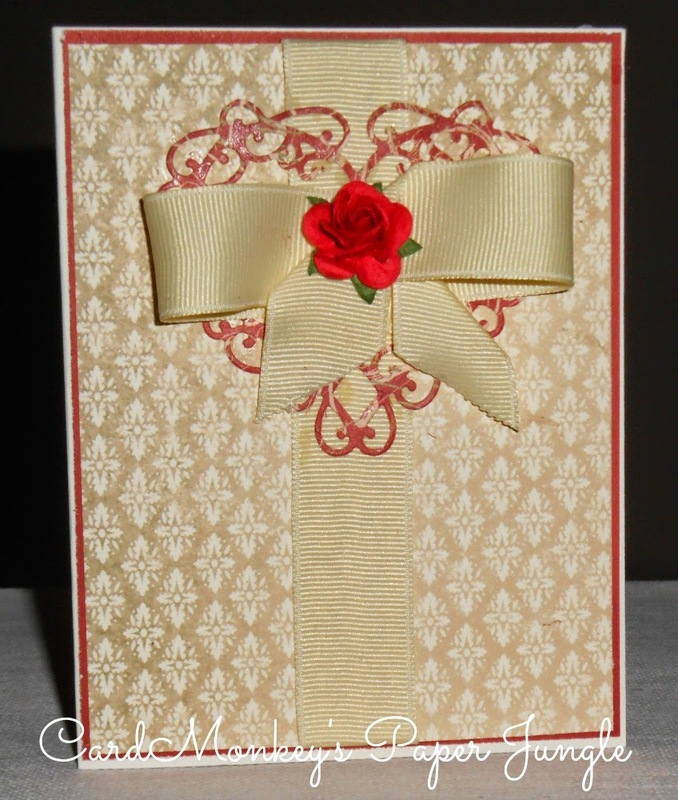 Before tying the bow, I cut an intricate die cut called "Celtic Heart" from Cheery Lynn Designs; I topped the bow with a romantic mulberry-paper red rose from Wild Orchid Crafts. 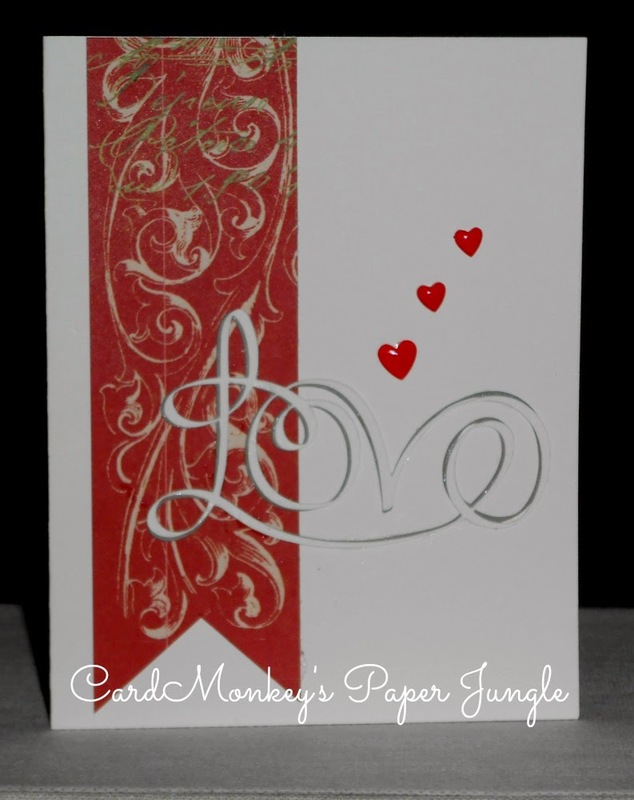 Love is definitely in the air with this pretty, detailed Valentine. Starting with a card base from CTMH White Daisy cardstock, I embossed/cut the beautiful pattern and heart opening using a die from Sizzix. The word "love" was cut from a piece of CTMH Slate cardstock, using a word pattern available from the Silhouette Online Store, and my Silhouette Cameo. The pretty leaf flourish was also cut using the Cameo and an SOS file, from CTMH Topiary cardstock, and topped with a mulberry-paper red rose from WOC. 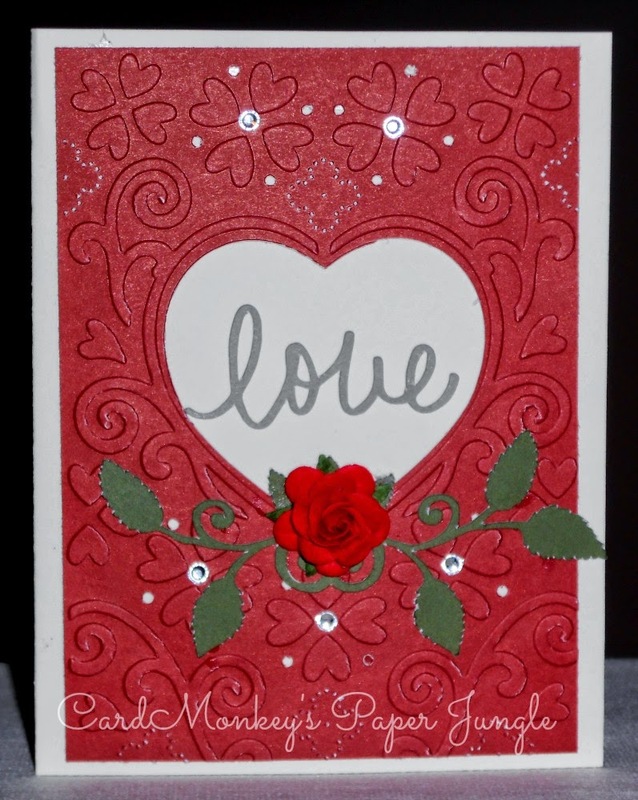 Again, for this card, I started with a CTMH White Daisy cardstock base, and topped the card with a piece of CTMH Ruby cardstock that I embossed using a ProvoCraft Cuttlebug hearts folder, and my Cheery Lynn Designs "Crossover" embossing machine. For the stamped roses, I used a CTMH floral stamp and the rock-n-roll technique to apply ink to the image before stamping. 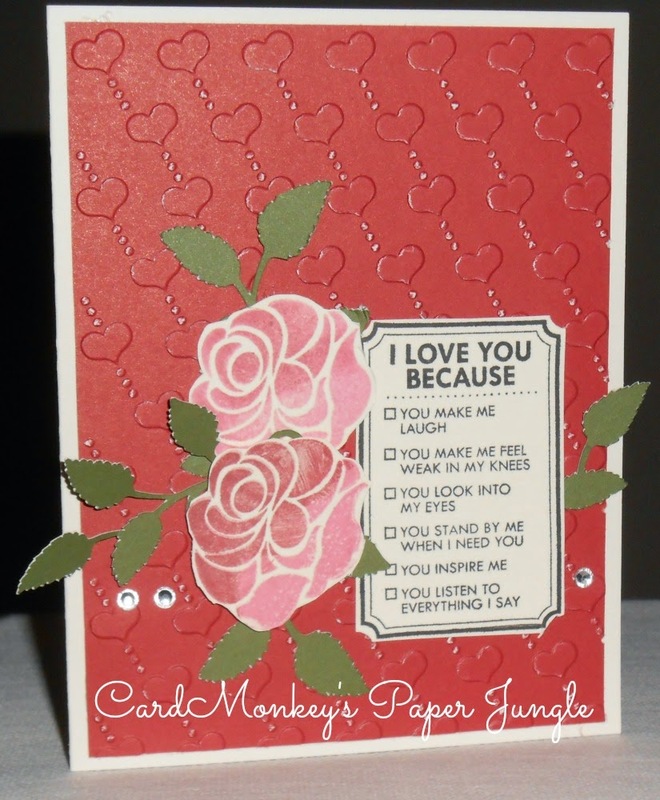 The "I Love You Because" stamp is also from CTMH, using CTMH Exclusive Ink in Black. The leaves were cut using a file from the Silhouette Online Store, and CTMH Topiary cardstock. Finally, for this simple card, I topped a CTMH White Daisy card base with a piece of Yuletide Carol paper that I had trimmed into a pennant shape. I then cut the word "Love" using a Silhouette Online Store word pattern; I cut it twice -- once in CTMH Slate, and the other in CTMH White Daisy, for a unique effect. The adhesive epoxy hearts are also from CTMH. Here is the link to the Yuletide Carol Paper. Here is a link to the Journaling Card Box. Here is the link to the Gold Rectangle Dazzling Diamond Sticker Sheet.